Voyaging through untouched snowy landscapes is an unforgettable experience. But in alpine regions, avalanches always pose a threat. Avalanche airbags are a fundamental component for handling danger. 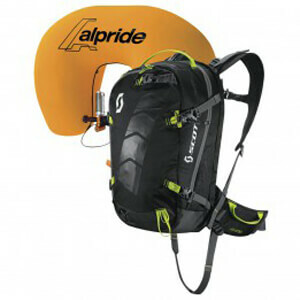 Avalanche airbags make it possible to carry other avalanche safety equipment. They come with mechanisms that greatly improve your chances of survival. In many cases, an avalanche backpack can save your life as well as the lives of your tour partners. Neither probes nor shovels will help your tour partners if you're personally buried. That's why many avalanche backpacks include so-called avalanche airbags. These work somewhat like automobile airbags. A large airbag is inflated within a split second of being triggered. This airbag helps you float on top of an avalanche instead of sinking underneath it. The airbag is activated by means of a trigger pull on the shoulder strap. In various systems, tour members can also activate the trigger by remote control. Some avalanche backpacks pursue a different path. They allow victims to make the best use of the residual air available to them. Snow can consist of more than 50% air, even in wet snow avalanches. Systems like the AvaLung System by Black Diamond make use of this air. For this purpose, an artificial air pocket is created via a breathing circuit. These systems recover air from the snow when you inhale. And when you exhale, they release it through a valve in the back. This significantly improves your chances of being discovered alive. Any good avalanche airbag provides room for other types of rescue equipment. These include avalanche transceivers, avalanche probes, and avalanche shovels. Additional features vary greatly depending on immediate requirements and the size of your wallet. Some backpacks are furnished with additional back protectors that shield your back from inevitable collisions. Some models also have well-insulated hydration systems that still work reliably after several hours in snow and ice. Regardless of technical finesse, even the best avalanche backpack can't replace careful planning and adequate experience in evaluating the site.